Moeen Ali gave the England selectors another nudge with 99, his second half-century in three County Championship matches, to help Worcestershire forge a lead against Derbyshire at New Road. But it was centurion Alexei Kervezee who stole the show, hitting 110 as the hosts moved into a winning position. 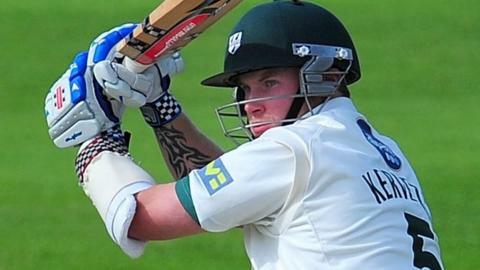 Alexei Kervezee averages over 100 against Derbyshire in first-class cricket. Three of the Dutchman's five first-class centuries have been against Derbyshire. He scored 130 against them at New Road in May 2010 - his maiden century. He then hit 155 - his career-best in the return at Derby just two months later. His other two centuries were 144 against Surrey in August 2010, before making 128 against Notts at Trent Bridge in April 2011. Aided by Gareth Andrew's unbeaten 71 and 41 from Ben Cox, Worcestershire closed on 432-9 - a lead of 213. After taking tea at 241-4, the home batsmen made 191 in the final session. It was slow going for Worcestershire early on in the day at New Road on a dry and dusty pitch in reply to Derbyshire's 219. Resuming at 31-0, just 75 came in the first session as spinner David Wainwright dismissed both openers, while Moeen was dropped in the gully off Wes Durston on 14. After giving another sharp chance, the England hopeful then batted aggressively ahead of Thursday's next selection announcement, only to go in the last over before tea. It was another story in the evening session as Andrew plundered six fours and five sixes, but fellow fast bowler Jack Shantry, who went into the game averaging 47 in first-class cricket this season, missed out, being removed for a golden duck, one of three wickets for Mark Footitt. "Alexei Kervezee put his horrors of last season behind him, when he averaged only 10.57 in 10 matches in the County Championship. "But it was Moeen Ali who changed the whole balance in the game when he came out after lunch to attack the bowling, after the morning run rate had hardly crept above two an over. "Maybe not Moeen's most fluent innings. He edged through the slips a few times. But, with Ben Cox and Gareth Andrew joining in the mayhem, Worcestershire have given themselves a real chance of victory."